Astrolab ventures undergo a tailored and phased commercialisation process. Through several levels of validation they then graduate to incubation where they prepare themselves and then launch. For more venture information please contact us. With deep industry experience, the Fishery Logistics team have developed a tiered technology solution that collates, improves and distributes fishery data/information for industry and governments worldwide. This platform has been tested and validated on fishing fleets around NZ to effectively improve the fishing value chain from end to end. By focusing on ease of use and integration with the most well-known technology on the planet, Popin have developed a unique platform for engaging the debilitated and aging community. The venture ties a tried and true business model with a new device, overcoming a challenging barrier to entry, as well as channeling other emerging technologies. Varroa mites are a constant threat to beehives around the world and are thought to be the main factor contributing to colony losses and colony collapse disorder. By leveraging cutting-edge science with deep industry knowledge Pheromite has developed a novel approach to control Varroa mites in beehives. Although the initial focus is in controlling the Varroa mite, the technology developed will have long ranging applications on broader pest and insect management in years to come. Many industries face significant challenges around managing and extracting value from waste water. Aquafortus has developed a novel draw solution enabling an extremely energy efficient forward osmosis process to tackle this waste water challenge. The Aquafortus system effectively reduces the volume of any waste water created in an industrial process, improving the recovery of valuable minerals and significantly reducing associated costs, with the byproduct being fresh water. Envisi offers a novel bird deterrent system for protecting high value crops, such as wine grapes and Kiwi-fruit, at a fraction of the current cost. This solution can easily be left in place or moved as required with no impact on other fruit management activities. Flow Holdings are developing an advanced, innovative organic flow battery. Tuned to either providing near-infinite charging cycles, or highburst power needs, the batteries will be significantly cheaper and environmentally friendly to manufacture and own. Freighthub provides businesses with a cost effective and easy freight solution. Using innovative systems and a depth of knowledge of the industry, they are able to allocate freight in an efficient and intelligent manner to increase fleet utilisation, and reduce freight costs. Ubiquitome's mission is to enable universal access to genomic information through ubiquitous cloud connected, genetic analysis devices. 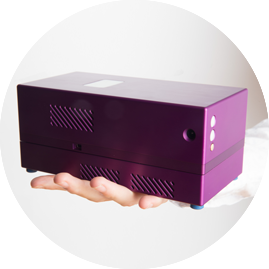 Ubiquitome's first product, the Freedom 4 has been designed to offer the gold standard performance of laboratory based platforms anytime, anywhere.